Also Known As: 9V, PP3, LR22, MN1604, BLOC, E-BLOC, 6LR61, 1604AU, X22, 1604, 1604A, 1604AC, 4022, 522, 6AM6, 6F22, 9VOLT, A1604, CLR6, K9V, KA9, ND65V, R22, RB100890. 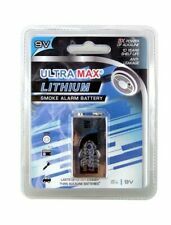 Rayovac 9V Lithium Battery, 1 Pack 10-year Service Life In Ionization Smoke Alarms • Lasts 2x Longer Than 9v Alkaline In Most Other Devices • Ideal For Smoke Detectors, Home Security Devices & More • Wide Operating Range • Lightweight • One carded 9V 1-Pack Lithium Battery, 9 Volts • Lasts 2 times longer than alkaline in most other applications • Ideal for smoke detectors, parking meters, home security devices, emergency exit alarms, baby monitors, and more Combine safety and security with this 9V lithium battery. 10-year service assure long-lasting performance. 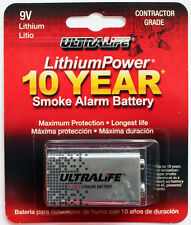 Ideal for dependable household items including smoke detectors. 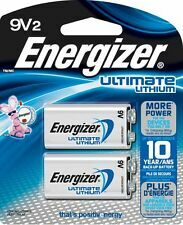 Battery Type: Lithium Battery Size: 9V. 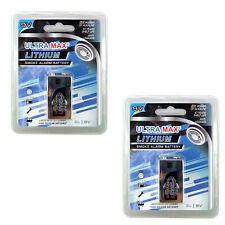 ULTRALIFE 9v Lithium Battery. Best if used before 2026. Procell batteries are a high quality power source that are an excellent utility for any job site, workplace or office.Features & Benefits. 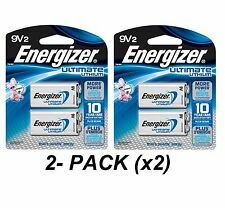 9V Duracell Procell Alkaline Battery. Sold in boxes of 12.